Can 110 million people be wrong? 5pm: Thriller by the Edison Charter Academy is back! Be on time at 5pm! Album not for sale, but maybe you’re one of the 110 million. Want your youth program to perform or participate in the market? Get in touch! 4 – 6:30pm: Catch squeeze box goddess Renee de la Prade, with “a low-slung button box and a funky fusion of old Celtic melodies, zydeco and punk rock power.” Check out her 11/11 show at the blue macaw or grab an Accordion Babes calendar while you’re at it! 6:30pm: Acoustic set with the Mission’s own Jivano’s Cutlery Service. 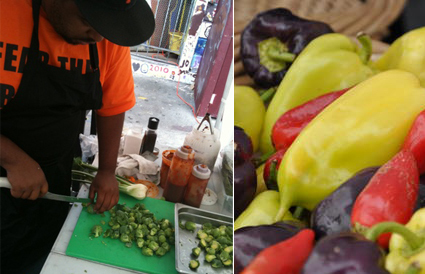 Get down to the Blue House Farm booth and chow on delicious peppers and brussel sprouts – witnessed here going straight into Dontaye’s dishes at Good Foods Catering, just a few steps away at the MCM. That’s Amore! per la comunita! For his love of and commitment to the community, Paul Geffner, owner of Escape from New York Pizza, has been given the Certificate of Honor (video of commendations) from Supervisor Campos and the City of San Francisco. Paul has done amazing work for the community with improving 22nd Street public space and starting the Mission Community Market, all after years and years of support for local artists, poets and his employees. Thanks Paul! An honor well-deserved. Check out the local artistry and leave a tip at EFNY on 22nd and Bartlett. 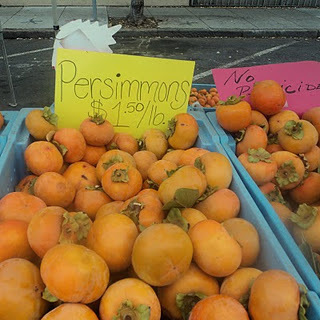 Fresh persimmons (like the ones from Arata Farms) can be somewhat mystifying and even a little intimidating if you’re new to them. Firm on the outside with a tender flesh, they look like an orange tomato but have a taste that is sweet, rich and satisfying. 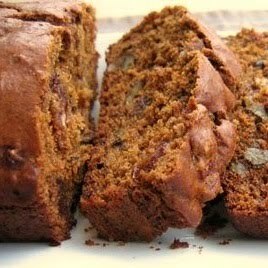 In this easy, vegan quick-bread recipe (adapted from this one from Fat Free Vegan), persimmons get the banana bread treatment. The bread is moist and sweet enough without it, but if you’re craving icing, whisk together 1/3 cup powdered sugar, a few drops of vanilla and a splash of soy milk for a quick glaze to drizzle over the top. Preheat oven to 350 degrees F. Lightly grease a medium loaf pan. In a small bowl, use the back of a fork to smash the chopped persimmons. Stir in the lemon juice, oil or apple sauce, and sweetener. In a large bowl, combine the remaining ingredients, except for raisins and walnuts. Pour the wet into the dry and mix just until all flour is moistened (do not over-mix). Fold in the raisins and walnuts, if desired. 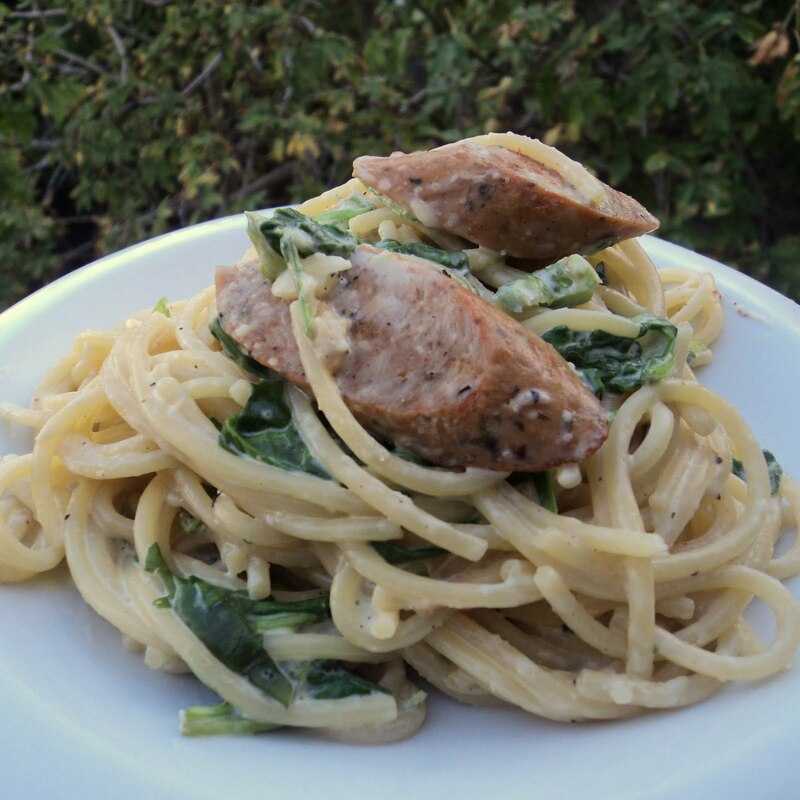 Pour into the prepared pan and bake until a toothpick inserted in the center comes out clean, about 35-45 minutes. Allow to cool for 10 minutes and then remove from the pan. Cool completely before slicing and serving.